Now you could understand the rationale behind this trade for both sides. For the Rams, they were poised to move forward as the reincarnated Los Angeles Rams with quite possibly the worst quarterback situation in the league. I mean, nobody believed GM Les Snead when he said that Keenum had "earned" the starting job going forward and it was widely expected that they were going to be drafting a quarterback early. The problem for them was that it was not likely that one of the top two quarterback prospects, Carson Wentz of North Dakota State and Jared Goff of California, were going to be available at the 15th pick. Now, they will have to pick with no risk of somebody jumping ahead of them. For the Titans, this makes total sense. They certainly have their fair share of needs but one of the few bright spots on their roster is the quarterback position after the promising rookie campaign of Marcus Mariota. And while they obviously won't be able to take the same quality of player at 15 instead of one, they should still be able to land a quality prospect and now they also have the picks to build up their roster. But in the end, the Titans are the clear winner in this trade. They had been rumored to desire a trade out of the top pick and they got themselves a significant haul here. For the Rams, they are taking a big risk. And that risk is twofold. Regarding the aforementioned Griffin, one of the things that did hurt him and his injury issues is that Washington, without the draft picks that they had to surrender to bring him in, they struggled to build out the offensive line in front of him and didn't exactly give him the best of supporting casts. The Rams do have clear areas of talent but it is not as if quarterback is the only weakness. Now without all those picks they gave up, that puts the pressure on a) the quarterback they do pick and b) the front office that now has very little room for error on the picks they still have. 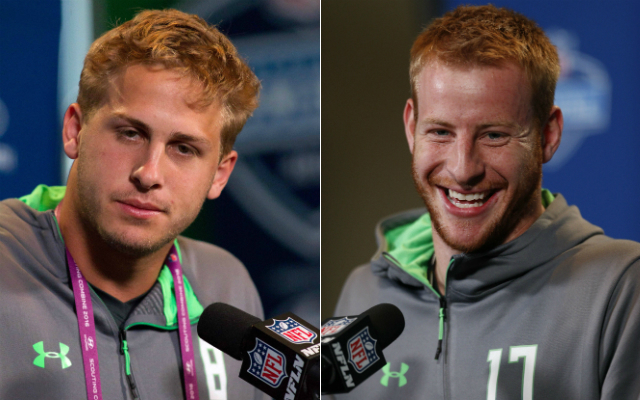 But ultimately, here is the multi-million dollar question: are either Wentz or Goff really the kind of can't miss prospect that is worth betting the farm on? Now don't get me wrong, I like both and I think both are worthy of top ten picks. Now I think Wentz is the better prospect and I'm a fan of his strong arm, his mobility and his underrated accuracy and ultimately I believe he is the guy that the Rams are going to target at one but NDSU to the NFL is a pretty big jump and there isn't a particularly big sample size. As we all know, Los Angeles is a town driven by stars and you can't ignore that fact. The Rams lacked an answer at the most important position on the field and now they can sell the folks of the Southland that they have got a future star under center. It came at a great cost to them but if Wentz or Goff turns into the answer, they'll make out just fine.